Dental implants are surgically placed into the jaw bone to replace the roots of missing teeth. Dental implants usually have a special coating, or rough surface, to allow bone growth into their micro-structure. This creates a strong bond between bone and the dental implant surface. This is called “osseointegration”. Once in place and integrated with their surrounding bone, dental implants can support a porcelain tooth or bridge, or provide stability and retention to removable dentures. Implant teeth feel, function, and look like natural teeth. They feel so natural that people who have them will forget their presence in their mouth. 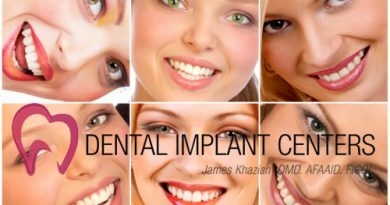 An implant tooth is generally made of 3 major components: An implant fixture which is anchored in the bone, a porcelain crown (tooth), and an abutment which connects the crown to the dental implant. Porcelain crowns which are made the exact size, anatomy, and color of natural teeth are the only visible part. Dental implants and abutments are covered by bone and gum and are not visible, and can only be seen by an x-ray. It is possible for 2 implants to support a 3 or 4 teeth bridge. It is also possible to replace all upper or lower missing teeth with 4 to 8 implants.